The breaking news tonight, word that “Don’t Ask, Don’t Tell” –considered kindness when it was instituted and now reviled by most fair-thinking people–is on its way out. The quote: The Pentagon is set to certify that the U.S. military is prepared to accept openly gay and lesbian service members, and that doing so will not harm military readiness. Wow. Only earlier in the day I was reading the annoucement that Ann Curry and Don Lemon will be key speakers at the National Lesbian and Gay Journalists Association convention in Philadelphia in late August. I’m not sure I knew there was such an organization…even though it’s 21 years old. The group’s press release says about 300 media people will be there. 300? Of course, the media might be somewhat behind the military in its acceptance of its lesbian and gay members–most people I know in the industry believe such identification would immediately kill their careers. Unless they don’t tell, and are not asked. 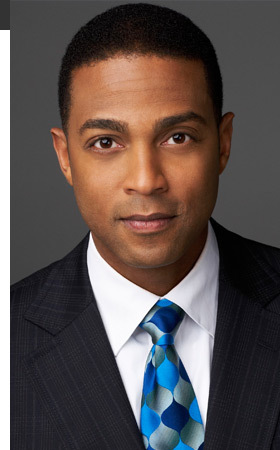 Don Lemon is an exception to that rule–for the first time that I know of, an anchor who revealed that he was gay–wrote a book about it, and went on book tour. Transparent is the story of his life and career, and his decision to come out. He is still employed at CNN–I watch to make sure he’s still holding forth on his weekend shows–and was frankly worried when he was out–probably doing his duty as a newly minted author, making the rounds. I’ve known Don since he was, really, a kid. Running scripts at the Fox-owned television station where I hosted a talk show in the late 90’s. He made the leap from lowly intern to big-shot anchor–and we both had some moments of jubilation when he interviewed me a couple of years ago. What satifaction to see the system really work. Speaking of work–the NLGJA has its work cut out for it. Now that the military has acknowledged that the forces can still be ready for war if gays and lesbians fight–will the media acknowledge that openly gay and lesbian reporters and anchors can report? Let’s hope for a thousand attendees next year. Great Article Ms. Jenkins! I remember watching you doing midday in NYC…Best Wishes!